For over 100 years, fraternities and sororities have played a vital role in the rich history of campus vibrancy at Stetson University. Grounded in the university's core values - personal growth, global citizenship and intellectual development - Fraternity and Sorority Involvement works to provide opportunities for service, leadership, scholarship, learning and lifelong relationships. Strive for academic excellence through scholastic programs that will enhance the student experience. Foster and promote brotherhood/sisterhood amongst all Greek organizations. Will be responsible for our actions and recognize their implications in the Stetson Community. Provide a safe and welcoming space for all students who participate in our programs and experiences. Cultivate leadership experiences for our Greek Affiliated students. Promote and celebrate the service and philanthropic excellence of our Greek community. Fraternities and Sororities prioritize service and philanthropy. Each semester members of the Stetson University Greek community serve Stetson University, the DeLand area and its surrounding communities through service and philanthropy. Throughout the year, individual chapters sponsor a philanthropy or service project that affords members the opportunity to give back to the community. At Stetson University, our greek community strives for academic excellence. 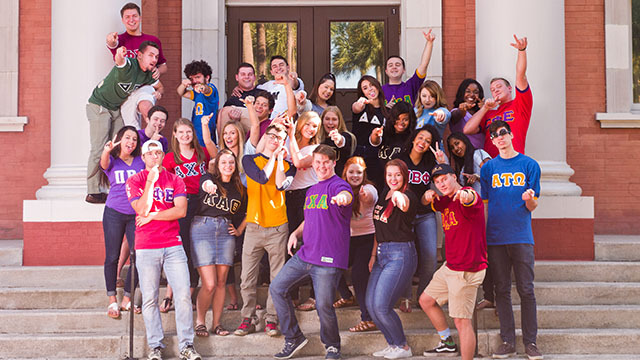 School comes first and being apart of a fraternity and sorority community provides the opportunity for students to be provided academic support from their peers and expectations for academic excellence in their prospective organization. The 2015-2016 GPA Average amongst all greek organizations is a 3.07 GPA. Going Greek can be for everyone! Our current greek community has six National Panhellenic Conference Sororities, two National Pan-Hellenic Conference Organizations, and eight North American Interfraternity Conference Fraternities. Greek life is always growing and changing at Stetson University. As an institution, we are constantly working to provide multiple opportunities for students to be engaged in the fraternity and sorority community. Interested in an organization that is not on this campus? Please review our Expansion Packet for more information on how to bring another social greek organization to Stetson! Panhellenic primary recruitment will take place September 4, 2019 - September 7, 2019 (with Bid Day on September 8, 2019). Register today to be a participant in Panhellenic primary recruitment. Registration closes on Septmeber 2, 2019. IFC Recruitment registration will open soon, check back for more information. If you have questions about Fraternity & Sorority Involvement at Stetson University, reach out to stetsongreeks@stetson.edu.